A primary school pupil has been learning to speak 10 languages in addition to English. Arpan Sharma, 10, from The Blue Coat School, Edgbaston, Birmingham, has reached the final of a national language contest for the second year. Arpan speaks his mother tongue Hindi at home, learnt four languages at school and has been using interactive, multimedia CD-ROMs for the others. He is interested in becoming a doctor and working around the world. 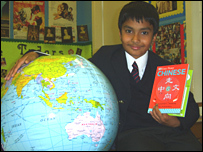 Arpan picked up Hindi from his parents and has learnt French, Spanish, German and Italian at the fee-paying school. Using the interactive methods at home he learnt to speak Thai, Swahili, Polish and Chinese Mandarin and is now studying the Lugandan language of Uganda. Arpan said: "I like learning them. I think they're enjoyable. "You have to have a desire to learn languages otherwise you'll never get anywhere, because if you don't have a desire, then you'll never want to learn them." He said his favourite language is probably Hindi, which is "very, very different" to English. "You don't say my name is. You say my name Arpan is." Arpan, who came third in the national Junior Language Challenge last year, is one of 30 youngsters who have reached this year's final to be held on Friday. The school's deputy head, Richard Lynn, said Arpan, who has also expressed an interest in becoming a musician or journalist, has a "natural gift" for languages. Mr Lynn said: "He's also a very talented musician, so I think the ear that he has for music also helps him with his languages. "He is without doubt the most talented pupil linguistically we've ever had." The deputy head said Arpan was reasonably fluent in Hindi and the four languages he has studied at school, but the others "learnt at speed" are "more sketchily known". He said the boy has added Polish, Chinese Mandarin and the Lugandan language of Uganda within the last year as he prepares for Friday's final. Mr Lynn said: "He was very young last year - it was a case of throwing him in at the deep end and seeing what happens and it was amazing. "Obviously he's older this year and he's had more opportunity to work on his languages. "One starts to learn English pretty much as soon as one hops out of the womb, so the earlier one learns it the better. "It certainly makes children able to appreciate language more and makes them realise that it's not something that's simply spoken by 'funny foreigners'."